The floating islands on Lake Titicaca in Peru are famous throughout South America. As we stepped off the boat, the “land” trembled beneath our feet. Some actually stumbled they were so startled.“I’m from California. I’m used to earthquakes” I quipped. Actually I just pretended that I was still on a boat because, in a sense, I was.The floating islands on Lake Titicaca in Peru are famous throughout South America. The Uros tribe members create their “land” from the long totora reeds that crowd the lake for miles in certain areas. They tie the harvested reeds in bundles to make great rafts, sometimes anchoring them with stone, but usually nestling them within the living reeds. More reeds are then chopped to create even surfaces for walking. The reeds have many uses on the islands. The Uros skillfully weave them into boats that are wonderfully buoyant and they are the main building material for the homes. Even food is created from the pith of the reeds, which make a nourishing asparagus-like vegetable. Some of the pith is also dried and turned into flour, which is then made into bread. 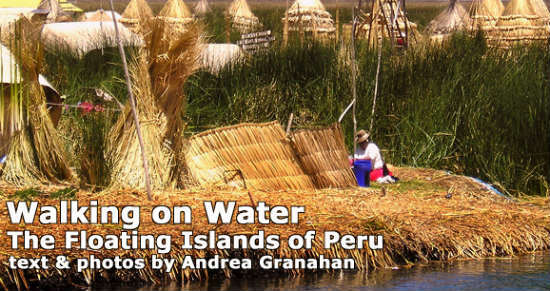 The Uros began their floating lifestyle about two centuries before the Spanish conquest. While the Incas were busy empire-building, the group marched to the lake. The Uros had lived on the shores until then, but with the advancement of Inca armies they took refuge, hiding in the reeds. For a long time, the Incas did indeed march right on by to go to war with the Aymaras, who lived on the far side of this huge lake. The two armies battled back and forth for years. However, the Incas eventually discovered the Uros, resulting in enslavement and taxation of the island dwellers. In the end, the Incas gave up, leaving the Aymaras triumphant. 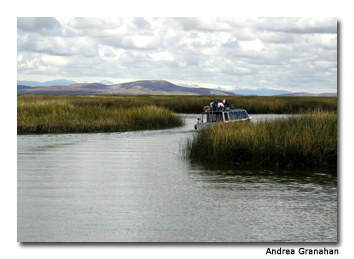 The Uros began a small trade with the Aymaras, providing fish and reeds for land-raised goods. Eventually, the Aymara tongue was adopted by the Uros. One thing didn’t change — the Uros didn’t leave the reeds. They remained where they felt safe and knew how to survive. To this day, even finding the floating islands takes a canny guide and skillful boatman to reach the water paths amid the miles of reeds. In the middle of the island where we had been welcomed was a small hole where the Uros kids learn to swim. When literally living on a lake, drown-proofing the children becomes a priority. There is also a small lookout tower on each island. 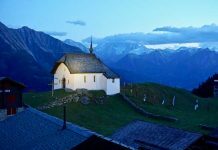 This offers a way to stay in touch and signal one another as well as watch for trouble, or, these days, visitors. While other Peruvian tribes revere Pachamama, or Mother Universe, the Uros revere Mother Lake. The bountiful lake provides them with fish and reeds, and the reeds provide them with nearly everything. I notice strange-looking contraptions on the roofs of the straw huts. It seems the Uros used to use fish oil lamps or candles for light but that created a fire danger. Some bright soul came up with the idea of a small solar panel that could light a single light bulb and now most primitive straw huts throughout the villages have their own panel. Special care has to be taken when cooking and fires are made atop stones so as to not burn the ground beneath them. A kind Uros woman showed us how she made her flour, grinding it between stones taken from the mainland, and let us taste the flatbread she baked. A big pot of water was kept at hand to douse any sparks that might fly. Living on a floating island has its advantages. When the family gets too large or if there are disagreements in a village, a section of the island is sawed off and it floats away. Our guide told us the island we were visiting used to be much larger, but that had occurred just recently here. Thus, the number of islands varies, but there are generally between 40 and 50 at any given time. It takes a skillful boatman to reach the Uros’ floating islands through a labyrinth of reeds. Island living also has its problems. The reeds have to be replenished constantly. We watched straw boats hauling in large loads of reeds for that purpose. If the reed mat gets so thick as to touch bottom, it begins to rot, so a boat must be hired to tow the island to deeper water. If not kept up, the surface of the island can get spongy underfoot. Islands usually last a full generation, about 30 years, so island making is a constant project. The surface of the island was strewn with chopped dry reeds. It was like walking where a bunch of hay bales had broken open. The golden color contrasted vividly with the green of the surrounding reeds and the blue of the lake waters. In the market of the nearby town of Puno, the Uros hold the monopoly on fish sales. These days, however, as the fame of their strange islands spread, tourism is becoming an important source of income, with many of the tourists being fellow Peruvians. The Uros boast skilled needlewomen and their work is in demand by visitors, increasing income. The men, so good at weaving their own boats, also weave miniature ones to sell. Most of the people incorporate tourist visits from small groups like ours into their regular routines and offer natural hospitality. However, some only see dollar signs. One obnoxious fellow followed us on our ride on a straw boat playing the flute quite badly all the while, and then demanded a tip. I wondered whether that attitude would spread among these innocent people whose unique culture had survived for so long. Nowadays, many of the young people paddle off in their boats to settle on shore and get jobs on the mainland. From thousands, the number of Uros still on the islands is down into the hundreds. While there is still a lively village life with people paddling between islands and hauling their catch to shore, I fear the Uros way of life is slowly disappearing. The older folks do, too, as they lament the steady drain of their young. Of course, I can understand the lure of a life with bright lights and solid ground beneath one’s feet. Originally a ‘Bama girl, Andrea Granahan left the South and settled in Bodega, California. An award winning journalist and former newspaper publisher, she now does freelance travel writing and loves out-of-the-way places.